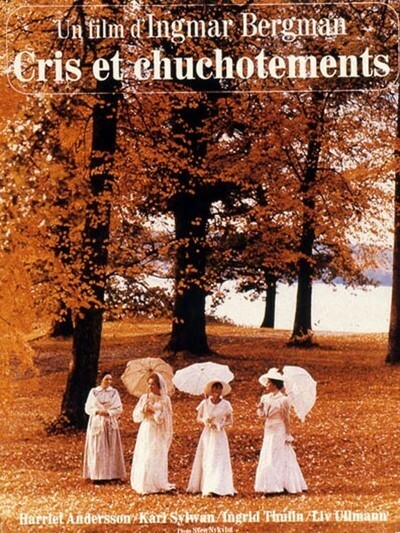 "Cries and Whispers" is like no movie I've seen before, and like no movie Ingmar Bergman has made before; although we are all likely to see many films in our lives, there will be few like this one. It is hypnotic, disturbing, frightening. It envelops us in a red membrane of passion and fear, and in some way that I do not fully understand it employs taboos and ancient superstitions to make its effect. We slip lower in our seats, feeling claustrophobia and sexual disquiet, realizing that we have been surrounded by the vision of a film maker who has absolute mastery of his art. "Cries and Whispers" is about dying, love, sexual passion, hatred and death - in that order. The film inhabits a manor house set on a vast country estate. The rooms of the house open out from each other like passages in the human body; with the exception of one moment when Agnes, the dying woman, opens her window and looks at the dawn, the house offers no views. It looks in upon itself. Three women stay in the house with Agnes (Harriet Andersson), waiting for her to die. She is in the final stages of cancer, and in great pain. The women are Karin and Maria, her sisters, and Anna, the stout, round-cheeked servant. In elliptical flashbacks (intended to give us emotional information, not to tell a story), we learn that the three sisters have made little of their lives. Karin (Ingrid Thulin) is married to a diplomat she despises. Maria (Liv Ullmann) is married to a cuckold, and so she cuckolds him (what is one to do?). Agnes, who never married, gave birth to a few third-rate watercolors. Now, in dying, she discovers at last some of the sweetness of life. The sisters remember that they were close in childhood, but somehow in growing up they lost the ability to love, to touch. Only Anna, the servant, remembers how. When Agnes cries out in the night, in fear and agony, it is Anna who cradles her to her bosom, whispering soft endearments. The others cannot stand to be touched. In a moment of conjured nostalgia, Maria and Karin remember their closeness as children. Now, faced with the fact of their sister's death, they deliberately try to synthesize feeling, and love. Quickly, almost frantically, they touch and caress each other's faces, but their touching is a parody and by the next day they have closed themselves off again. These two scenes - of Anna, embracing Agnes, and of Karin and Maria touching like frightened kittens - are two of the greatest Bergman has ever created. The feeling in these scenes - I should say, the way they force us to feel - constitutes the meaning of this film. It has no abstract message; it communicates with us on a level of human feeling so deep that we are afraid to invent words for the things found there. The camera is as uneasy as we are. It stays at rest mostly, but when it moves it doesn't always follow smooth, symmetrical progressions. It darts, it falls back, is stunned. It lingers on close-ups of faces with the impassivity of God. It continues to look when we want to turn away; it is not moved. Agnes lies thrown on her deathbed, her body shuddered by horrible, deep, gasping breaths, as she fights for air for life. The sisters turn away, and we want to, too. We know things are this bad - but we don't want to know. One girl in the audience ran up the aisle and out of the theater. Bergman's camera stays and watches. The movie is drenched in red. Bergman has written in his screenplay that he thinks of the inside of the human soul as a membranous red. Color can be so important; in "Two English Girls," a movie about the absence of passion, Francois Truffaut kept red out of his compositions until the movie's one moment of unfeigned feeling, and then he filled his screen with red. All of "Cries and Whispers" is occupied with passion - but the passion is inside, the characters can't get it out of themselves. None of them can, except Anna (Kari Sylwan). The film descends into a netherworld of the supernatural; the dead woman speaks (or is it only that they think they hear her?). She reaches out and grasps for Karin (or does Karin move the dead arms? - Bergman's camera doesn't let us see). The movie, like all supernatural myths, like all legends and fables (and like all jokes - which are talismans to take the pain from truth) ends in a series of threes. The dead woman asks the living women to stay with her, to comfort her while she pauses within her dead body before moving into the great terrifying void. Karin will not. Maria will not. But Anna will, and makes pillows of her breasts for Agnes. Anna is the only one of them who remembers how to touch, and love. And she is the only one who believes in God. We saw her in the morning, praying. We learned that she had lost her little daughter, but is resigned to God's will. Is there a God in Bergman's film, or is there only Anna's faith? The film ends with a scene of astonishing, jarring affirmation: We see the four women some months earlier, drenched with the golden sun, and we hear Anna reading from Agnes' diary, "I feel a great gratitude to my life, which gives me so much." And takes it away.